Originally, most fire alarms were Heat Detectors, rather than Smoke Detectors. A Heat Detector is insensitive to smoke but will detect the increase in temperature when there is a fire. Heat detectors are still widely used in kitchens, preventing constant alarms when cooking. Heat Alarms cover a relatively small area, therefore it may be advisable to have more than one heat detector in your kitchen. Although Heat Alarms continue to serve a purpose, it is highly recommended to invest in Smoke Detectors throughout your home. These days, our homes are much more flammable than in the past. With the increase of various synthetic materials, house fires spread much more rapidly. It’s likely that your soft furnishings contain polyurethane foam, notorious for burning very quickly, producing thick smoke, intense heat and gas. 1. Ionisation – These alarms are sensitive to fast-flaming fires with small smoke particles. 2. Optical/Photo Electronic – These alarms are sensitive to slow-burning fires with large smoke particles. 3. Combination – Optical Smoke and Heat Alarm – These alarms give you the best of both worlds offering fast smoke detection without constant false alarms. False alarms can make us complacent – It’s Essential to Never Ignore an Alarm! It is important to assess your home and determine which fire alarms will suit you best and in which areas. As a general rule, you will require at least one on each floor and a combination optical and heat alarm will probably be best. However, the more alarms you have the better the protection. It is advisable to consult an electrician to assess and install your smoke detectors. We all know the importance of correctly installing a fire alarm, testing it regularly and replacing the batteries. However, for maximum protection, it is best not to rely on batteries alone. You can connect your smoke detectors directly to your electrical system. 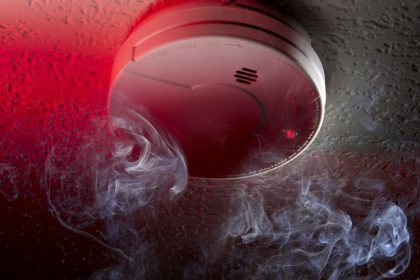 By hard-wiring your smoke detectors and interconnecting them throughout your house, you can have peace of mind that you will know the second that one of the detectors senses smoke, as all alarms will sound in unison. At Paul Hunt Electrical Installations, we appreciate that the safety of you and your family is paramount. It is important to ensure you have the warning as soon as possible to increase your escape time. Contact Paul Hunt Electrical Installations today to discuss the best smoke detectors for your home.